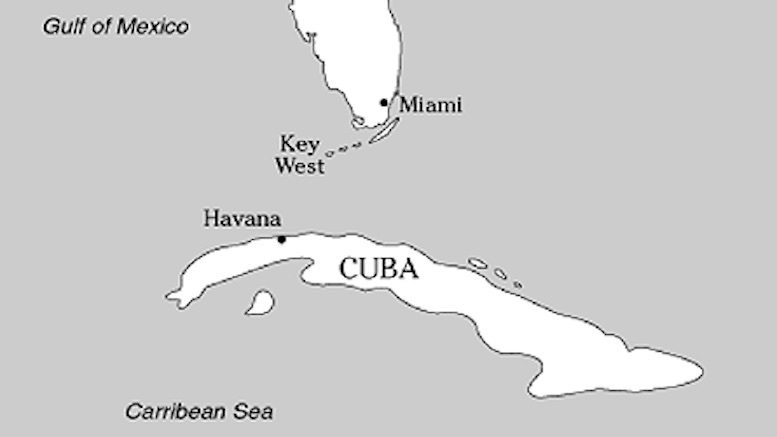 (Havana, Cuba) The fiercely independent country of Cuba has expressed deep concerns over a neighboring country that appears to be under the influence of an autocratic foreign power on the other side of the globe. Though such worries were thought fanciful at first, it now appears the that country in question – which lies only 90 miles to the north of Cuba – is very much in the grip of Russian controllers. The Cuban Government is considering imposing severe sanctions on its neighbor, until such time as it throws off the shackles of foreign interference. 30 Comments on "Cuba Alarmed By Presence Of Russian Client State Only 90 Miles Away"
Luv the comment about the nukes in Turkey to strike a deal! I wonder if Cuba has nuclear missiles in Turkey they could dismantle in exchange? That famous Irish demagogue, Séamus O’Barmer, prophesied this eventuality, when he declared that Russia’st trump card could be played, most effectively, to bring vassal States into line., and in the event of their withholding trade goods (tobacco, rum and bananas) , banning their export to their troublesome neighbour,,Rusia would return the rare metals, purchased from the preceding administration, with interest. That’s funny, I was on a ship just off the coast of a country in 1962 that had the same problem. Remember when Michelle Palin said she could see Russia from her back yard? Now she really can!!! Who’s Michelle Palin???? Sarah Palin never said such a thing– it was Tina Fey. Palin most certainly did say yhat on live TV no less! OMG. Sarah Palin DID say that she could see Russia from her backyard in Alaska. And, THEN Tina Fey made fun of her on SNL for making that ridiculous statement, as did everyone else in the world. Roil reversal works as well , Sara.. Roll ? Role ? Role reversal, roll reversal, roil reversal — they all work in this situation. Sadly a reflection of how the rest of the world perceives the States currently. It is called satire, folks. Peter Wyatt, was that a comment on what currently resides in the White House? Oh yes I remember, sorry. Fake news They are on international waters and this is not unusual..
like your sense of humour,sadly all to true. !! no you don’t……we have the nukes we just keep them in your backyard….for safety! hahaha…..we have nukes but not the codes to use them, we need the permission of the good ole’ yanks to use them. The Head Pig has already tried at least twice to back off things he said in Helsinki.